Over at LifeHacker a fascinating discussion of monitor size and productivity. It caught my eye as I’ve recently moved from a 30" monitor to a 24" and 12" setup. Strangely I find I’m more productive on the second setup. In any case, people have all kinds of strange setups including one guy with six 15" LCD’s all on a special mount. I think he’s onto something. As I said, I’ve gone from a single 30" to a 24" (1920 x 1200) plus a 12" (1280 x 960). At home I now have 20" (1680 x 1050) plus the same 12" (Macbook). I stopped running the 30" as my Macbook can’t do Dual-Link DVI. I thought my productivity would go down. No way. Substantially up. 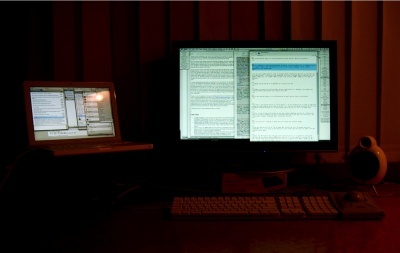 Managing the windows and flipping between applications was a hassle on the 30". With a dual monitor setup, all the distractions on small monitor. Work on big monitor. That said, I much prefer the 24" as a main monitor. I am less productive by an order of magnitude except when web browsing and writing on the 20". It’s just not big enough to handle two full size documents (without having 8 or 9 pt antialiased type to squint at). 24" is the sweet spot. Finally, if you can avoid TN screens on your main screen. Sometimes you want to stand up and look at your work. Sometimes you want to lean back and look at your work. You can’t do it. The colours go all wonky. Things get dark. The monitor distracts. Caveats: the 30" monitor does have two useful functions still. It is superb for sorting and editing high res digital photos (3000 pixels and up). It is also superb for running FCP. As I don’t do any video editing anymore only the first still applies to me. When I bought the 30" I was still planning to edit video. Running a company leaves no time and takes no prisoners though. I vote for many small ones. I’ve had budget contrainsts and was forced to choose between one 24″ or two 19″ LCDs (a few months apart). Given the choice between one larger monitor or two small ones, I would go for two small ones every time. Not necessarily for multitasking but because two separate monitors come in very useful for most of the tasks I come up against. I usually have one for active documents and the other for reference material.